Baby wildlife: are you helping or hurting? Many examples exist of people driving along down the road or working on their property and encountering a baby deer, raccoon, opossum, etc. Often, individuals are quick to swoop the animal up into their arms, and begin to worry about the care of these small, infant animals. Baby animals naturally look very helpless when encountered. Newly born deer slip, trip, and fall to the ground and stand with unsteady legs, just learning how to stand and walk. These animals’ mothers are generally in close proximity to the babies, but may be just out of sight. More times then not, most people pick up these animals in an attempt to help, but are actually hurting the well being of these infant animals. 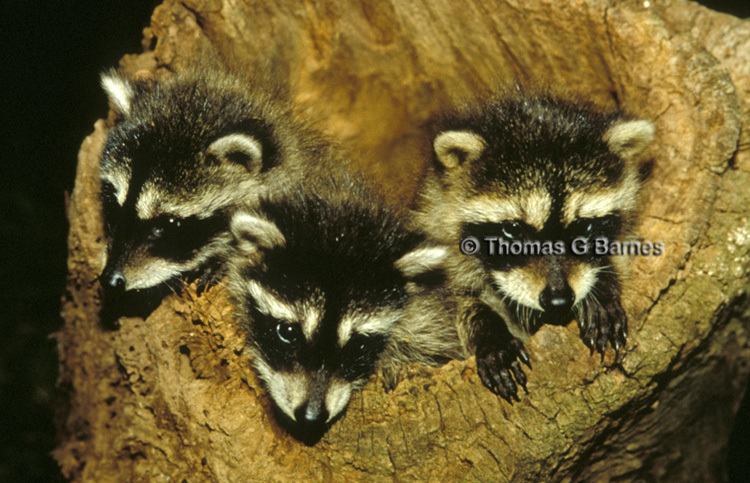 Baby Raccoons in their den. Animals are great parents. They raise and nurture their infants much like people and excel at being parents. They tend to the every need of their babies and will put their lives on the line in order to raise their young. This sometimes includes leaving their babies to search for food, or staying a distance from their young as much as possible to prevent attracting attention to an area where their young may be hiding. So even if you see a baby animal seemingly alone, more often than not, its mother will be close by. Sometimes there are special circumstances, where a baby’s mother is hit by a vehicle, or the baby is somehow injured to the point that without human intervention it will not survive. But even in these cases, one must be careful. Injured wildlife will fight for their lives and will make every attempt to defend themselves. Some animals may be sick, and a bite from one of these animals could pass diseases like rabies on to the well meaning person trying to help. One must also bear in mind that in many cases it is illegal to transport wildlife. So what can you do to help? The best thing to do is first analyze the situation. Does the animal appear injured? Is it alone? Is an adult of the same species somewhere in the vicinity? It is very possible that the fawn that you are looking at has its mother somewhere just out of sight, keeping an eye on it. If there appears to be a problem, contact your State Fish and Wildlife Office. They will be able to point you in the right direction of someone that can help you. The desire to help wildlife in need is a great quality, but use care and common sense. Don’t hesitate to contact someone who is knowledgeable and seek their advice. You may very well come into contact with wildlife in need of help, but at the same time, you need to exercise caution to insure that you are in fact helping, and not hurting our beautiful wildlife. For information about KY’s Wildlife Rehab info, visit this LINK. You can also visit this LINK for wildlife rehabilitation in Virginia. In Kentucky, rehab questions can be directed to 1-800-858-1549. In Virginia, the number to contact is (804) 367-1000. This entry was posted in Wildlife and tagged fawns, wildlife, wildlife rehabilitation by admin. Bookmark the permalink.